Home / Are Dental Implants Covered by Insurance? Dental implants are generally accepted as the best way to replace missing teeth, particularly large groups of teeth at once. No other method is as secure and long-lasting or provides as excellent results. But will your insurance cover dental implants? In most cases, with most dental coverage plans, your insurance will not cover dental implants. The stipulation is that there may be a cheaper method for replacing lost teeth. The insurance will likely cover that cheaper method, be it dentures or bridges, but it isn’t likely to cover the dental implants. Now this is how it is in general, but more and more dental insurance plans are starting to include dental implants in their coverage. This is because this method of teeth replacement is widely considered to be superior to any other. It will be more effective, provide a more natural look and last longer than any other method out there. Still, you do need to check with your insurance company before you go ahead with this procedure. They may or may not cover it for you, and you need to know before you commit to it. It can also help to get a pre-treatment estimate. This may not include the exact costs, but it gives you a ballpark figure to go by, and it can help you make the decision even if your insurance does not cover the cost for you. The slightly invasive dental implant procedure involves holes being drilled into the jawline. Only a few implants are needed, even for an entire jawline’s worth of teeth. The implants are placed inside the hole and the new teeth are attached to the implants. These are incredibly secure implants, as they are placed very tightly in the bone. The bone and gums will grow back around them, holding them in place. If you have this procedure done, know that you will experience some discomfort initially. You will only be able to eat soft food at first and you will likely experience some facial swelling. The healing process takes a few weeks, and during that time, you will have to be extra careful with your new implants. Not everyone will be eligible for dental implants. Only those with strong and healthy gums and jawlines will be able to accommodate the implants. Any patients with osteoporosis or gum disease will probably be turned down. Implants will last for years before needing any maintenance or replacement. That is most cases, however, as sometimes they will fail for a few different reasons. The most likely cause of dental implant failure would be because of poor dental hygiene. Not brushing or flossing regularly can cause the gum to deteriorate and weaken the implants. Another reason the implant might fail is because too much force is being placed on them. 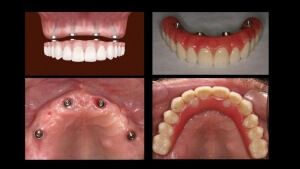 This often happens when the patient grinds their teeth, forcing the implants out of position. Simply taking good care of your mouth will ensure that they last for a long time.